A great night last night. We went a perfect 3-0 for some decent profit. We had all 3 of our games in regulation and although 2 of them we very close, in the end they all came through for us. The Rangers beat the Blue Jackets 2-1, the Lightning beat the Leafs 2-1 and the Sharks beat the Habs 6-2. I’m a sucker for games with an over/under of 4.5. They have played 3 times this year and there was goal totals of: 5, 4 & 6. Both come into this on losing streaks and both have slim playoff hopes. This is one where I feel the Over is a safe pick and both view this game as one the should win. These teams aren’t lighting up the scoresheets but they do get scored on a bunch. They are both in the bottom half of the league in goals against per game with the Oilers allowing almost 3 per game. This will be the first time that the first 2 picks of the draft play one another. McDavid missed the first game with the injury that sidelined him for a while. I see them both trying to one-up each other. The Flames are on a 5 game losing streak. They are 2-7-1 over their last 10 and are all but eliminated from the postseason with the teams in front of them and the ground they need to make up. The Bruins are in the playoffs but can’t be comfortable with the teams behind them. They need to win games like this one against a team who has and is struggling. If the hope to stay in the playoff picture then they need to win this game. Americans: Place your NHL bets at Bovada. Very trustworthy, 100% deposit bonus, and awesome player and team props. Canadians: Sports Interaction - $20 Free Bet and $125 in Bonus Money. Everyone Else: Bet365: €/£/$200 Bonus, additional €/£/$100 bonus when mobile betting for first time! Good deposit bonus, lot of unique bets & props. Excellent mobile & live betting. Quick note for people from United States: Be sure to subscribe to our daily tips, because not only will you get the tips e-mailed to you every day but we're working on some special mailing list exclusive bonuses and free bets only for people from United States. We bet 0.5u, 1u and 2u based on level of confidence. 1u is our standard bet size. 0.5u is when we feel a play has enough value, but aren't fully confident in the result. 2u is a rare play when we have maximum confidence. 18+. Gamble responsibly. Don’t blindly trust our tips – we’re just giving our opinion. Make up your own mind. If you’re a gambler we advise reading GambleAware.org to help you understand gambling more and what the repercussions of it can be. Disclaimer: BetNHL.ca is not affiliated with the NHL in any such way or form. 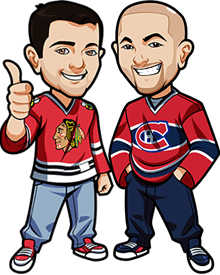 We are just 2 guys that love the NHL, love to bet on the NHL, and offer these NHL Betting Tips for entertainment purposes.